1. How a happy family works ? 2.What do you want right now ? 3.Why you should have a hobby ? 5. How to bring peace in the world ? When you feel, you have lost the focus of life, then come to basic of life. I mean concentrate on breathing. Breath in and breath out. Your every breath worths more than all the treasure of the world, because breathing means that you are alive and I think being alive is the real purpose. You can be alive even after death only by work that serves the want or need of mankind.The great people like Socrates, Plato, Leonardo da Vinci, Sir Isaac Newton,Thomas Alva Edison, william Shakespeare, Tolstoy, Mahatma Gandhi, Albert Einstein, Dell Carnegie still lives in their great works. I read somewhere , Martin Luther king jr. saying that Everybody can become great, but not famous. He just told a great philosophy within the line. So, our purpose in life must be to be happy, we can only become great when we do the work,that gives us pleasure and a content mind. I am writing this ,because I want you to be happy, because when you are happy, you are feel truly alive. Without the joy in your heart your life is a waste.The purpose life is to enjoy life doing the works that you love living with people who loves you and in a place that is good for health. Sometime you may feel like you have lost the meaning in life ? It feels you knew it before, but you have lost the meaning somehow and now you can not find it ! When it feels like that always do the work that makes you happy, most people find their true meaning in life by doing a work that they find most interesting or feel passion to the work. If you want to check how you are doing in life , then ask yourself – Am I happy ? If your answer is happy, do not worry any more. 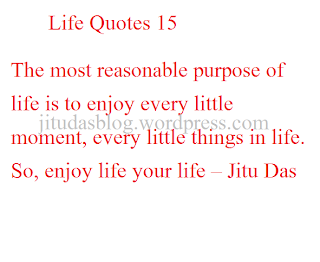 Because the most reasonable purpose of life is to enjoy every little moment, every little things in life. So, enjoy your life the way you can enjoy most.Do not worry what would people think about. You just enjoy every day from the sunrise of the morning to the stars of the night.The flowers in your yard, the road in your town, the trees that is all around.The bees and butterfly flying around the flwers.The sounds of cricket at night,the fantasy mood creating fireflies in the evening. Be grateful that you are alive,be happy that your family loves you. Be happy in every meal.Do not blame or curse people in their small mistakes. Everything happens for a reason. There is beauty in everything. A poet can see the beauty everywhere in nature.Be a poet, be a nature lover. Love the animals, help other people if you can.Talk sweet to people.Respect the elders. Do not give an eye for an eye. Be happy about who you are.Do not belittle yourself, no one is perfect, nothing is perfect. 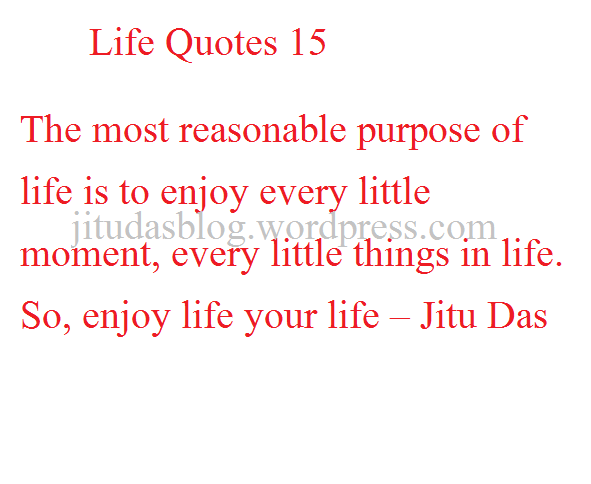 To enjoy life do the work that you are interested in to. Do not worry how to start doing the work.Just do it. You may not become excellent in one day, but trust me, it gets better as you keep doing the work.Most people say that it is the first step that is the most hardest step.So do not think so much about your first step, just do it, no matter what happens in the first stem, you may make mistake, it is okay, do not feel discouraged or be little yourself. Second step is always going to better and easy than your first step. I told you being alive is the real purpose. You can become great by doing great works,works that you love to do and do for pleasure more than money. You can always become great if you really want to, but not always famous, it’s not fair, do you think like that ? Great work will be always great,even if the work which is great, doesn’t become famous, in the life time of the worker, but its bound to be one day.Some great works take its time to be famous, because the people can not understand the value of those works instantly.I promise you. Many great workers had honoured after so many years later of their death. So have a smile on your face, be happy,don’t worry. One more thing, when you are with people and you are feeling bad,you should know that you are hanging out the wrong people. If the people you hang out everyday does not inspire,love and cares for you, you need to change the people immediately,like right now,this very second. Because if you hang out with people who loves you, you automatically feel good. 1. How to become both happy and successful ? 2. What do you need in life ? 3. How to find the work you were born to do ? 4.How to keep alive your passion ? 6.How choices makes you who you are ?